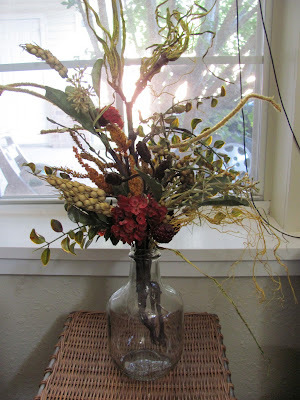 So technically, I decorated for a fall back in October, but of course I'm just now blogging about it. 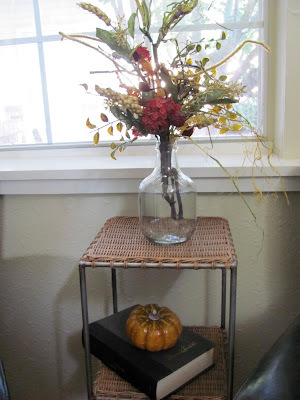 But let me just say, I like the fact that fall decor can go up in October and stay up until Thanksgiving. In my opinion, the decor is basically the same. I think I feel that way because I don't have any interest in decorating for Halloween. I just don't want spider webs on my porch and fake dead bodies coming up from my front yard. Ick. So anyway, this year I just threw around a few plastic pumpkins that I bought last year at Hobby Lobby. They were 90% off when I bought them so I think each one was around twenty cents. I didn't want to spend any money this year, so I was glad I picked them up last year. 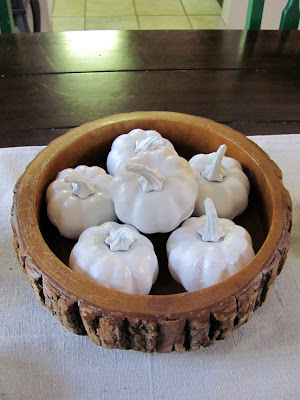 For the dining room table, I took a few more pumpkins like the ones below and painted them white. I also made a table runner out of burlap (originally a painting tarp). Technically, it's a little short to be a table runner, but since I made it, I guess it's my decision about how long it's supposed to be, right? I literally just noticed that Winston is sniffing a vase of flowers in the background of this picture... man, I love that dog. It's super simple, but I love it. I don't usually decorate our table with anything, but it makes me excited about fall every time I see it. 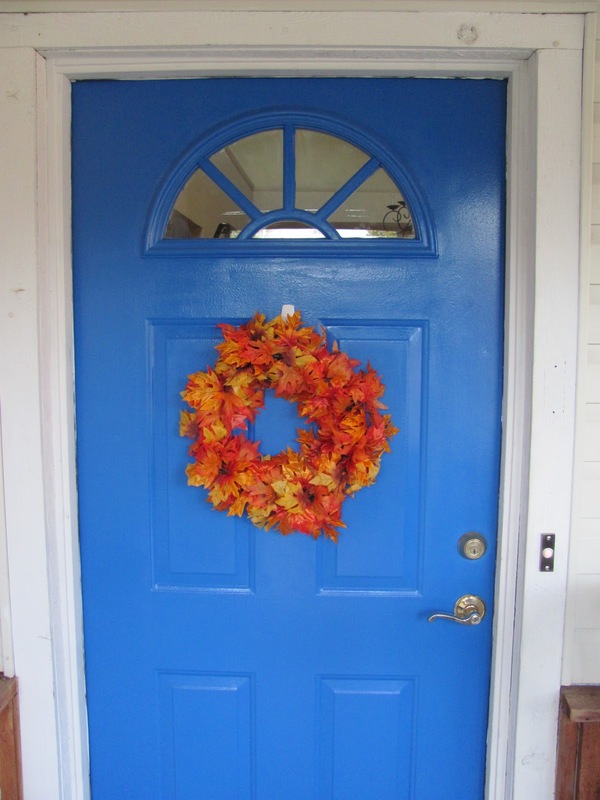 Finally, what decorating project is complete without a wreath? I made this one last year (see that post here) and I was happy to reuse it. I think it looks especially nice on our newly blue door. okay, LOVE the painted gords and pumpkins in the super cool tree bowl! Can't wait to see your christmas decor! 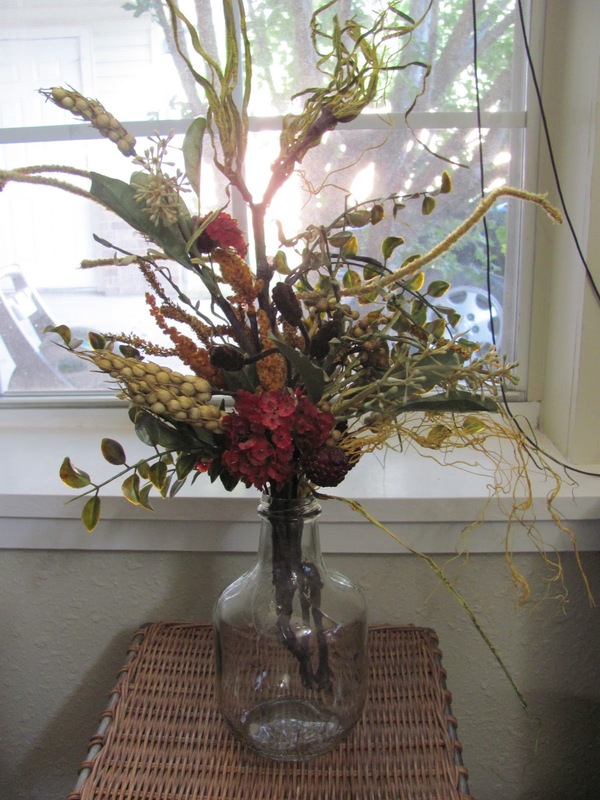 I really love your fall decor. However, my favorite part is your awesome Kelly Green chairs! I cannot wait to browse more around your blog and see the rest of your adorable home.